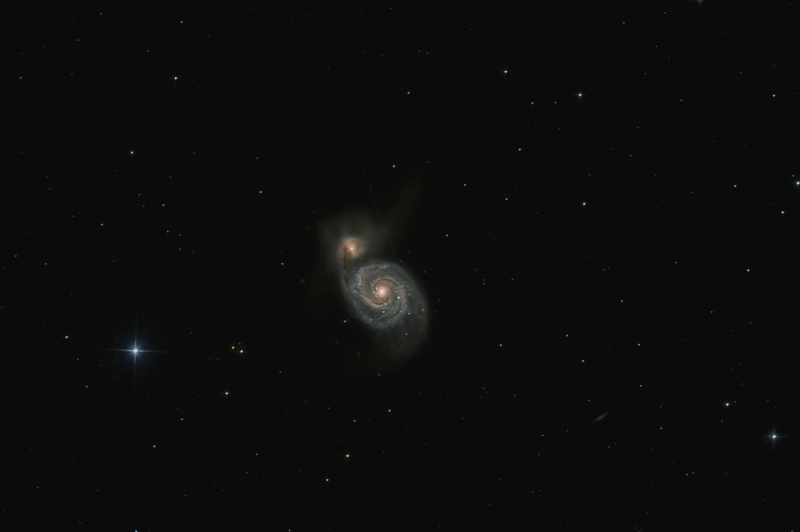 This is an image of M51 taken from my favorite dark sky site. It is a test shot with a Canon 60Da and by cliclikg over the image you can see a comparison of a similar image taken using a 350D. There was a stiff breeze that caused quite a bit of star trailing and blurring of the galaxy. Most of this was processed out (see details below) but the galaxy is not as sharp as it could be. The noise characteristics of the 60 Da are vastly superior to my 350D. Although the noise level is about half at equal ISO's it is the fine, high spatial frequency character of the 60Da noise that makes the images much easier to process out of the image. Processing Calibration, stacking, DDP, sharpening in Images Plus 5 . Very slight noise reduction applied in Paint Shop Pro . Wind driven star trailing was corrected in Images Plus 5.